Unfortunately for Keith, he’s got a couple of misery guts for parents. Nothing seems to get them to smile and they are always sad and full of dejection. 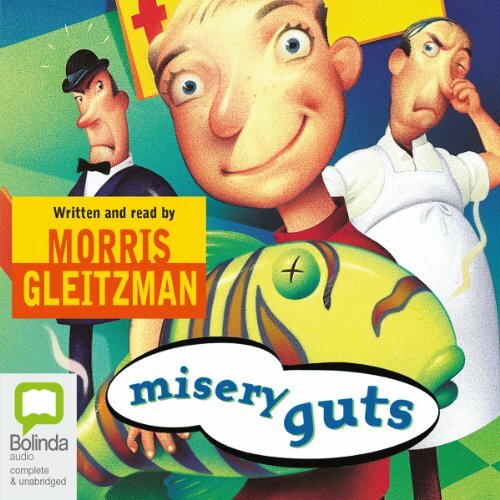 Misery Guts written and performed with a cheerful enthusiasm by award-winning children’s author Morris Gleitzman, is the funny story of Keith and his clumsy but well-intentioned attempts to cheer up his parents. The problem, Keith finally realizes, is the drab and dull setting of England. This epiphany sets off a hilarious chain of events as Keith tries his best to get his family to relocate to the beautiful Australia. "I'm only going to say this once more," said Dad, "so listen very carefully. We are not ever, under any circumstances, going to Australia." What does a kid do when his Mum and Dad are misery guts? Move them to a tropical paradise, decides Keith. That'll cheer them up. It's a brilliant plan, if he can pull it off.